Real Madrid have crashed out of the UEFA Champions League with one of the most shocking nights in European football history. Ajax Amsterdam have created history tonight by becoming the first side after Juventus in nearly half a decade to defeat Madrid in a European knockout tie. The young squad of Ajax over-turned a one-goal deficit from the first leg to win the return leg away from home 4-1. Yes, you read that right, four away goals from Ajax Amsterdam at the Santiago Bernabeu. The Eredivisie side were by a country mile the better team overall in the tie. A 5-3 aggregate victory over the three times defending Champions has announced the arrival of a new contender for the coveted UEFA Champions League trophy. The party began very early for ten Hag’s men when Hakim Ziyech netted the first goal in the 7th minute. David Neres doubled the scoreline after ten odd minutes, and it always seemed like an uphill task for Real Madrid from then on. The Whites were forced to make two quick substitutions half-way through the first half when Lucas Vasquez and Vinicius Junior hopped off the pitch. Do we have any Real Madrid fans who love the Fast and Furious movie franchise? Hey Real Madrid, do you miss him? Indeed it has been a hard night to digest for football fans across the globe. Isn’t this Tweet a bit too harsh for Courtois who was instrumental in keeping the goal count down to 4? Courtois: I’m leaving Chelsea to win the champions league with Real Madrid. Oh dear oh dear! Those are some figures to watch out for! Well, what’s done is done, there’s nothing Real Madrid can do about their horrible season. It would be better for Florentino Perez to start building a side for the next season. It’s going to be a hectic summer in Madrid following this season which is more or less likely to end trophyless. The changes need to begin right from appointing a more suitable manager who understands the Real Madrid job with clarity. No doubt, Madrid would have to burn the cash to lure in a couple of big name signings. Arsenal Eyeing A Move For This 18 Y/O Dutch Sensation: Right Man To Replace Alexis Sanchez? Real Madrid Eyeing A Move For This Ajax Sensation: Can Zidane Land Him? 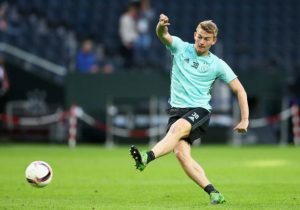 West Ham United Ready To Compete With Southampton For This Dutch Sensation: Is He Worth The Fuss? Arsenal Could Have Free Route To Sign Dutch Starlet On The Rise: Should They Go All In? Birmingham City Eyeing This Ajax Fullback: Can Redknapp Pull This Off? 3 Alternatives For 21 Y/O Ajax Starlet At Barcelona Including This Unsettled Tottenham Hotspur Man!